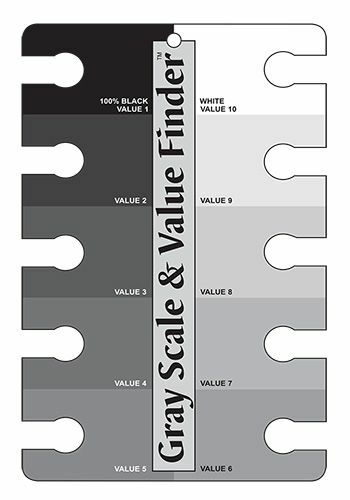 Grey samples allow for better and more accurate readings and also provide ample area for testing colour samples. 4" x 6" (10.2 x 15.2 cm). A folding version of the Colour Wheel. Illustrates the result of mixing colours, tints, tones, and shades. Reverse side is uncoated to allow you to paint your own personal palette. Features grey scale and many definitions. Folds to 3“ x 5“ (7.6 cm x 12.7 cm) for storage and convenience. 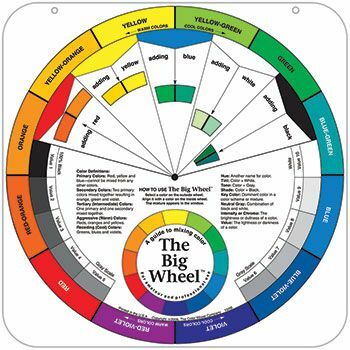 ​​​​​​​An indispensable tool for artists and colour designers at every experience level. Shows artists how to mix beautiful, luminous colours. 324 colours created from 18 tube paint colours. Detailed instructions and list of pigments included. UV coated for fade resistance, durability and protection. 11 ½ x 11 ½ inches. ​​​​​​​STUDIO TEACHING AID SIZE: 24"
Teaches colour relationships by organizing colours in a circle so you can visualize how they relate to each other. Both wheels feature EXACTLY the same information and format.